The event will take place on Wednesday 11 October at Autoworld in Brussels. This event is an excellent opportunity to engage with key policymakers, industry and research community representatives on the potential and future of Fuel Cell micro-Cogeneration in Europe. We invite you for discussions on how this technology can efficiently generate heat and electricity at home and how it can empower energy consumers in their energy choices, while contributing to Europe’s energy transition and providing greater flexibility for the energy system. 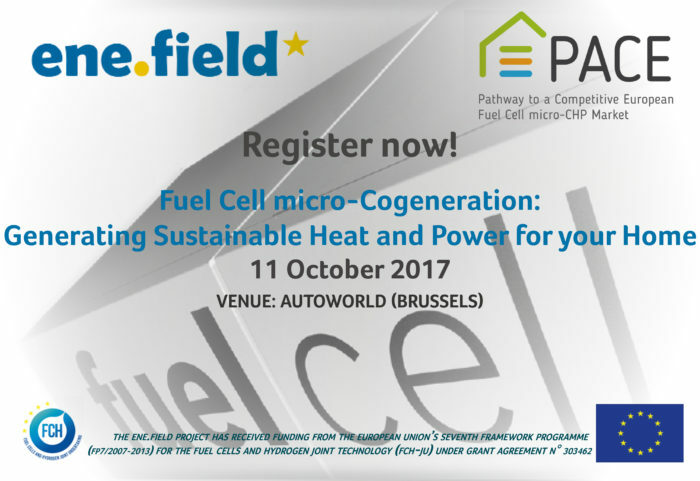 The event, organised in partnership with the Fuel Cell and Hydrogen Joint Undertaking, will present the key findings of the EU flagship project ene.field and introduce the PACE project, which will build upon the success of the ene.field project. As a cherry on the cake, you can take a closer look at the Fuel Cell micro-Cogeneration units on display at the event’s exhibition! ene.field and now PACE are the largest European demonstration projects of the latest smart energy solution for private homes, micro-CHP. ene.field and PACE will see over 3,500 households across Europe able to experience the benefits of this new energy solution. The projects use modern fuel cell technology to produce heat and electricity in households and empower them in their electricity and heat choices and bring together partners including European manufacturers, utilities, and research institutes making the products available across 11 European countries. The ene.field project has received funding from the European Union’s Seventh Framework Programme (FP7/2007-2013) for the Fuel Cells and Hydrogen Joint Technology (FCH-JU) under grant agreement n° 303462. The PACE project has received funding from the Fuel Cells and Hydrogen 2 Joint Undertaking under grant agreement No 700339. This Joint Undertaking receives support from the European Union’s Horizon 2020 research and innovation programme and Hydrogen Europe and N.ERGHY.